To be updated as new notices are available. Below is a notification from the OKIB Emergency Operations Centre regarding the current situation with creeks and waterways. Current Situation: In cooperation with Central Okanagan Regional District Emergency Operations Centre (CORD EOC) and District of Lake County (DLCC) , the Okanagan Indian Band initiated the removal of debris to alleviate water flows into Duck Lake for protection of properties on Duck Lake IR#7 lands and membership. The OKIB EOC is asking for public assistance in exercising caution when near waterways, to stay safe a 10-metre setback is recommended. Banks of creeks are saturated making them easier to wash out. Also, due to the groundwater saturation, what appears to be stable ground may be dangerously compromised and rapidly destabilize underfoot. The waterways will be monitored 24 hours a day and overnight in set time blocks. If you notice any severe changes or obstructions to the waterways, please call the OKIB EOC at 250-542-7132 or after hours at 250-306-9796 and do not attempt to remove obstructions yourself. In the event of major impact flooding updates will be posted at: www.okib.ca/departments/okib-emergency-operations or webpage/Facebook Page and Twitter. Visit cordemergency.ca for the most up to date information, and resources on how to be prepared to keep your family and property safe. Sign up for e-updates on the cordemergency.ca website to have the latest news delivered to your inbox. Holiday Park will be monitoring things here at the resort. If anyone has anything to report please email: holiday@sweetlife.com or phone: 250-766-4255. If you have any questions please contact Dan Sigal at dan@sweetlife.com or Don Culic at gm@sweetlife.com. The resort is still experiencing some ground water issues and will continue to monitor the situation. Current Holiday Park Resort flood watch updates can be viewed on our website at dev.sweetlife.com under the Member News tab. Renovations in the storage compound are almost complete and will be ready by the end of May or first part of June. It still has controlled access at this time - for entrance please see security. All resort amenities and facilities continue to remain open for everyone to enjoy. Kelowna, BC - Emergency officials and local government staff are responding to various reports of small landslides and localized flooding because of groundwater and high water levels in low-elevation streams throughout the Central Okanagan. Properties along Okanagan Lake are currently not at risk of flooding. The Okanagan Lake level is being closely monitored and managed by the province and is not anticipated to be a concern in 2018. The Emergency Operation Centre has been activated to support crews in the field responding to the issues of localized flooding during the 2018 freshet. The Emergency program reminds property owners that they are responsible for having tools and equipment necessary to protect their properties from possible flooding. Sand and sandbags are available at locations across the Central Okanagan for residents that are in vulnerable areas or who have previously experienced freshet flooding. Visit cordemergency.ca/map to find sand and sandbag pick up locations. In the event that a homeowner needs to construct a sandbag dike or wall to protect their property, residents are encouraged to review the sandbagging tips and information provided by Emergency Management BC. Emergency management crews and municipal staff monitor area waterways and culverts on an on-going basis and are in daily contact with Provincial departments to monitor creeks and rivers. They expect it will be about two to four weeks - depending on weather - before spring runoff peak flows from higher elevation snow melt arrives in the valley bottom. Some smaller creeks fed from low level snow melt have already started to rise. Anyone noticing a non-emergency flooding concerns is asked to call their local municipality. As creeks and streams are continuing to rise, residents are also advised to use extra care and attention around local creeks. Hikers and walkers should be aware that fast moving water may cause some creek bank erosion and creek bank edges may not be stable. Visit cordemergency.ca for the most up to date information, and resources on how to be prepared to keep your family and property safe. Sign up for e-updates on the cordemergency.ca website to have the latest news delivered to your inbox. Holiday Park will also be monitoring things here at the resort. We are still experiencing some ground water issues and will continue to monitor the situation. If anyone has anything to report please do so by email: holiday@sweetlife.com or by phone: 250-766-4255. All resort amenities and facilities continue to remain open for everyone to enjoy. The golf course land will most likely not be developed until 2019. Renovations in the storage compound are underway and will be completed by May/June of 2018. It still has controlled access at this time; for entrance please see security. Current Holiday Park Resort flood watch updates can be viewed on our website at dev.sweetlife.com under the Member News tab. If you have any questions please contact Dan Sigal at dan@sweetlife.com or Don Culic at gm@sweetlife.com. 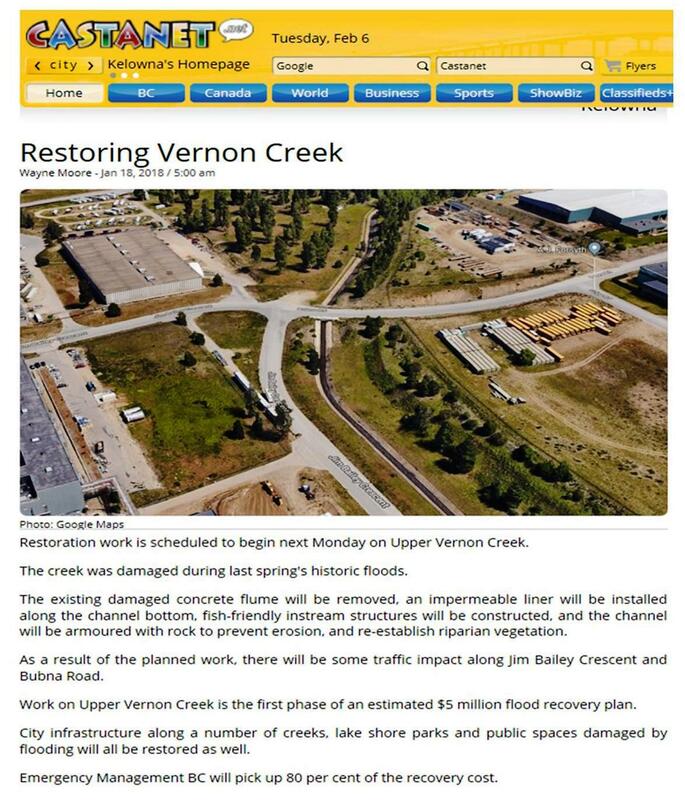 The reconstruction of the Vernon Upper Middle Creek has been pretty well completed and looks good. There is still some construction going on at the creek that runs through the golf course area, so please be careful and use caution when in this area. Flood protection has been put in place and we are confident with the steps that were taken to protect the resort from the creek flooding over its banks. We are, however, still experiencing some ground water issues. We are taking preventative measures and will continue to monitor the situation. The storage compound will be completed by May/June of 2018 and still has controlled access at this time. For entrance to the compound please see security. All resort amenties and facilities continue to remain open for everyone to enjoy. Current Holiday Park Resort flood watch updates can be veiwed on our website at dev.sweetlife.com under Member News. 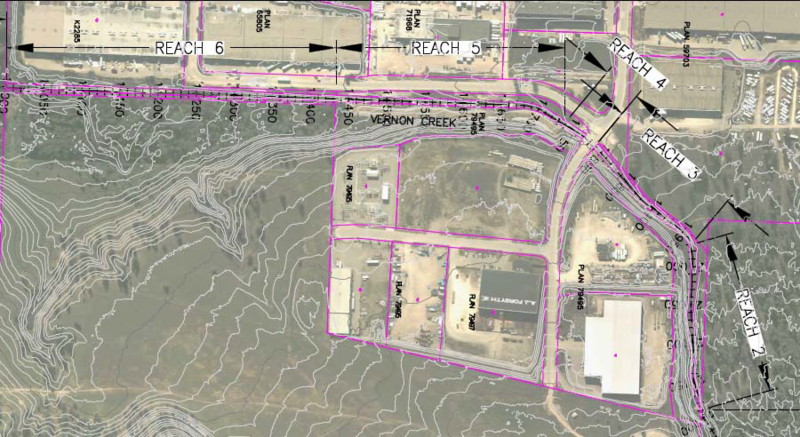 The reconstruction of Vernon Upper Middle Creek to its original state is currently underway. We are excited to see the creek repair finally taking place. Click here to view the Castanet.net article posted on February 6, 2018 in regard to restoring Vernon Creek. The resort is still experiencing some ground water issues. We are taking preventative measures in dealing with the ground water and will continue to monitor the situation. The golf course land will most likely not be developed until 2019. Renovations in the storage compound are underway and will be completed by April/May of 2018. It still has controlled access at this time; for entrance please see Security. All resort amenities and facilities continue to remain open for everyone to enjoy. Holiday Park Resort is happy to announce that the reconstruction of Vernon Upper Middle Creek to its original state is scheduled to take place starting in January 2018 with an expected completion by March 2018. Crescent through a combination of undermining and the forces exhibited by the flood waters. The City of Kelowna is planning on making repairs to the damaged sections of the flume by removing the existing concrete and naturalizing the channel. The primary goal for this project is restoring flow conveyance and 200-year flood capacity to the channel. The project is intended to begin early January 2018. Work is expected to be complete by the end of March before the 2018 freshet begins. The project consists of removing the concrete channel in Reaches 3 and 5 per the image below and naturalizing the channel complete with a waterproof liner and rip rap armoring. Naturalization of the channel vs. replacing the concrete was chosen for aesthetic reasons and this provides an opportunity to create fish habitat and fish passage. The Bubna Road bridge in Reach 4 will be repaired as part of the works. Reach 6 will be cleared of existing granular materials and repaired as necessary to aid in conveyance and then assessed for future works. Parking along Jim Bailey Crescent will not be permitted during the entire project duration. Access to nearby properties will be maintained but there will be periodic disruptions during construction. Construction hours are typically scheduled for Monday to Friday, 7 a.m. to 5:30 p.m. However, due to the limited window for project completion, work will likely occur outside of regular construction hours, including frequent nights and weekends, to minimize impacts on businesses and limit the time of active construction in the area in order to achieve project completion before the upcoming 2018 freshet. During construction it’s likely you will experience construction noise and vibrations. We recommend you safely store any delicate items from shelves or walls. The City of Kelowna, Infrastructure Division has successfully completed several major projects of this nature. The success of these projects was largely due to the much appreciated cooperation of those directly impacted. The City of Kelowna appreciates your patience during construction and apologizes in advance for any inconvenience. To find more information about parking, road closures and resources visit www.kelowna.ca/roadreport. Renovations in the storage compound are underway and will be completed by spring of 2018. It still has controlled access at this time - for entrance please see security. For any questions, please contact Dan Sigal at dan@sweetlife.com or Don Culic at gm@sweetlife.com. Past and current Holiday Park Resort flood watch updates can be viewed on our website at dev.sweetlife.com under the Member News tab. We will continue to keep you updated in the New Year as things progress. Holiday Park Management and Staff would like to wish everyone the best of the holiday season and a healthy, happy New Year. We are now feeling more confident that the Aquifer that was filled due to the flood is now dissipating and due to this the ground water is lowering throughout the resort. As a result we are feeling that any underground winter freeze ups are at a minimum. We have discontinued with the pumping of the Sewer Treatment Plant. The plant is currently working well. You may have noticed some of the sites being dug up over the last month. This was to repair damage to the sewer lines that was caused by the flooding and groundwater issues. At this time we feel that the repairs have gone well. Holiday Park Resort continues to work with the City of Kelowna and the Okanagan Indian Band to reestablish Vernon Upper Middle Creek to its original state due to May’s disaster. The storage compound will be renovated and redesigned by spring of 2018. It still has controlled access at this time. For entrance please see Security. On September 16, 2017 at 1:00 PM, in the Recreation Centre, the management of Holiday Park Resort will be hosting an Information Meeting, with a wine and cheese reception to follow. All leaseholders and members are welcome to come. This will be an opportunity to discuss and update you on the flooding and ground water that has taken place within the resort. There will be a question and answer period as well. The City of Kelowna has completed the install of a pipeline to replace the damaged concrete flume. Holiday Park Resort continues to monitor the situation. The storage compound still has controlled access at this time; for entrance please see security. A lot of the ground water has dissipated within the resort. The resort has two permanent pumps in place and we are looking at adding an additional two. There are still two temporary pumps in place. All of these efforts have been helpful in moving the ground water back to the creek. Please continue to report any water that has come to the surface so that we are aware of the situation. The city of Kelowna has now completed the install of a temporary pipeline to replace the damaged concrete flume. This has helped to minimize the amount of ground water that can leach into the ground. We are continuing to monitor the situation and work on site with the engineering firm we have in place as well as off site with the City of Kelowna. Holiday Park continues to work with the insurance company, Stantec Engineering, Woodland Spirit Contracting and Dr. Robert Newbury along with the staff and leaseholders here at the resort. The storage compound still has controlled access at this time. For entrance please see security. There will be an Information Meeting, hosted by Holiday Park Management, being held on September 16, 2017 at 1:00 PM in the Recreation Centre. All leaseholders and members are welcome. There will be a more detailed update on the ground water situation at this meeting as well as a question and answer period. For yours and your pet’s safety, please keep away from any standing water in the resort as it has become very stagnant in some places. Holiday Park management and staff sincerely appreciate everyone’s cooperation and support during this challenging time, and we want you to know that we are all working hard on your behalf. All resort amenities and facilities continue to remain open for everyone to enjoy. If you have any questions in regard to the above please contact Dan Sigal or Don Culic. If you are a leaseholder, have an email address and would like to be added to our system to receive notifications, please contact the Front Desk at 250-766-4255 ext. 0 or email holiday@sweetlife.com with your site number, phone number and email address. Current Holiday Park Resort flood watch updates can be viewed on our website at dev.sweetlife.com under the Member News tab. For information and updates for the surrounding areas please visit: www.okib.ca (Okanagan Indian Band) or www.cordemergency.ca (Central Okanagan Emergency Operations). We have now seen a reduction in the ground water within the resort as the creek flow slows. The resort now has two permanent pumps in place as well as two temporary pumps which have also been instrumental in moving the ground water back to the creek. Please continue to report any water that has come to the surface so that we are aware of the situation. The city of Kelowna has been installing a temporary pipeline to replace the damaged concrete flume. The work on this should be completed by next week. Hopefully this will help to minimize the amount of ground water that can leach into the ground. We are expecting to see the success of that over the next few weeks. We will continue to monitor and work on site with the engineering firm we have in place as well as off site with the City of Kelowna. Holiday Park will continue to work with the insurance company, Stantec Engineering, Woodland Spirit Contracting and Dr. Robert Newbury along with the staff and leaseholders here at the resort. There is an HPLA Annual General Meeting being held on August 12, 2017 at 1:00 PM in the Recreation Centre. All leaseholders and members are welcome. There will be an update on the ground water situation at this meeting as well as a question and answer period. For your and your pet’s safety, please keep away from any standing water in the resort as it has become very stagnant in some places. Holiday Park management and staff sincerely appreciate everyone’s cooperation and support during this challenging time, and we want you to know that we are all working hard on your behalf. If you are a leaseholder and have an email address you would like on file; please contact the Front Desk at 250-766-4255 ext. 0 or email holiday@sweetlife.com with your site number, phone number and email address. As you know, we are still dealing with the ground water problem as it continues to find its way throughout the resort. We have seen a slight increase in the ground water volume in some additional areas of the resort; on Sunset Road by condos 1 and 4 and behind those buildings to the community gardens. We are now pumping the ground water in a few locations and feel things are fairly stable. Please report any water that has come to the surface so that we are able to monitor the situation. We continue to strategize and work on site with the engineering firm we have in place as well as off site with the City of Kelowna. Holiday Park appreciates the city of Kelowna’s continued assistance on our behalf. Holiday Park continues to work with our insurance company, Stantec Engineering and Woodland Spirit Contracting, along with the staff and leaseholders here at the resort. Dr. Robert Newbury, PHD PEng, a world renowned hydrologist, is also still working on this problem. Along with this contingency of experts, we are currently monitoring the measures that are already in place to assess their effectiveness. The storage compound has controlled access at this time. For entrance please see security. Please be advised that we are communicating with your Leasehold Executive and are keeping them informed. Our budget has not been impacted as yet, however, if it is, we will advise them. Once again, Holiday Park management and staff sincerely appreciate everyone’s continued patience, cooperation and support during this challenging time, and we want you to know that we are all working hard on your behalf. Although some leasehold owners do not have an email address, we are asking If you know of any who are not receiving these emails, please ask them to contact the Front Desk at 250-766-4255 ext. 0 or email holiday@sweetlife.com with their current email address, site and phone number. Current Holiday Park flood watch updates can be viewed on our website at dev.sweetlife.com under Member News. All resort amenities and facilities continue to remain open for everyone to enjoy. As you know, we are still dealing with the ground water problem as it continues to find its way throughout the resort. For yours and your pet’s safety, please keep away from any standing water in the resort as it has become very stagnant in some places. Holiday Park continues working with the City of Kelowna, our insurance company, Stantec Engineering and Woodland Spirit Contracting, along with the staff and leaseholders here at the resort. Dr. Robert Newbury, PHD PEng, a world renowned hydrologist, is also still working on this problem. The City has really stepped up its assistance on our behalf. As well as working with these people, we are receiving tremendous support, which we very much appreciate. Along with this contingency of experts, we are currently monitoring the measures that are already in place to assess their effectiveness and are looking at both short and long term strategies to address the ground water issues. In the meantime, we will continue to pump throughout the resort to help minimize the ground water. Once again, Holiday Park management and staff sincerely appreciate everyone’s continued patience, cooperation and support during this challenging time, and we want you to know that we are all working hard on your behalf to help resolve this very difficult and frustrating ground water problem. In an initial and temporary fix to resolve the current ground water problem, we have dredged and redefined the channel through the golf course to improve the outflow of water from the park. In addition we have increased the pumping of water from the storage yard, as this is a low point in the resort, as well as from various areas throughout the resort, and are pumping the water back to the newly defined channel that is currently flowing into Duck Lake. The results from this initial effort will take time to have an effect and we will monitor this for the next week to see if this will work. Holiday Park currently has the support from the City of Kelowna, our Insurance Company, Stantec Engineering and Woodland Spirit Contracting, along with the staff and leaseholders here at the resort. Dr. Robert Newbury, PHD PEng, a world renowned hydrologist, is also working on the ground water problem on our behalf, and is providing some additional guidance and direction. Regarding the golf course, management believes it is necessary to stabilize the land and ensure that the water flowing through the creek will not flood the land again during high flood periods. Safety and long run stability must come first. Once the flow of water has been stabilized, it will be easier to determine the outcome of the land, and how to best utilize it again. Holiday Park management and staff appreciate everyone’s continued patience, cooperation and support during this challenging time, and we want you to know that we are all working hard on your behalf to help resolve this very difficult and frustrating ground water problem. All resort amenities and facilities are open for everyone to enjoy. Please come out on Saturday to watch the parade and celebrate Canada’s 150th birthday. PS: We still have 180 leaseholders for whom we have no email contact. If you know of any leasehold owners who are not receiving these emails, please ask them to contact the Front Desk at 250-766-4255 ext. 0 with their current email address, site and phone number. We want to update you on the ground water issues here at the resort. Unfortunately, the ground water issues have continued to get worse over the last week. We have water coming up in several new locations and the intensity is growing. We are now pumping in a few areas to reduce the risk of serious damages. The storage yard has been locked with access through security only. This is for safety and to minimize further damage to the yard. The ground water is a very difficult problem with no easy answers to resolve this issue. It is a very frustrating time for all of us and we really appreciate your support and understanding. Management and staff are currently working on site to help leaseholders and guests as best they can, along with the following people, to try and find answers. We will do our best to find some short term answers to resolve the ground water issues and then put in place a long term plan to help ensure this will not happen again if possible. Once again, thank you for your patience and understanding through this very difficult time. We will continue to update you through this process. As you all know the initial flood has receded and Duck Lake has gone down. We are in the recovery process for the Golf Course Club House & Washrooms and 2-3 lower level condos on the lake. Over the past 2 weeks we have seen the rise of ground water in the storage compound as well as the even numbered sites in the 300 and 400 section of the resort and it is now flowing over the roadways. Please know that your management and staff teams are taking all measures possible to minimize and deal with this problem. We have contacted the City of Kelowna, the Mayor and Council, the Central Okanagan Emergency Operations (EOC) as well as the Okanagan Indian Band (OKIB). The resort is currently getting attention directed our way as the pressures of Okanagan Lake continue to recede. The issues surrounding the flooding were the city’s priority, and rightly so. The support has been appreciated, however it is not easy to stop the flow of ground water and it will take time to find a solution for now and in the future. We will continue to do our best to keep you informed and up to date as things unfold. Please know that the resort is fully operational except for the golf course and clubhouse and that the current flooding has not impacted our day to day operations and activity schedule. Management and Staff appreciate all of your continued cooperation and support during this most frustrating time. Holiday Park Resort sincerely thanks everyone - emergency services, volunteers, staff, members & guests - for their patience and cooperation during the recent flooding in our area, which affected approximately 10% of our 67 acre RV & Condo Resort. With our area snow pack now gone, the level of our small lake has receded considerably and the resort is 90% operational. All facilities are open with the exception of the golf course, as cleanup in the few affected areas progresses. Resort sales and inquiries remained active even during this time, with interest continuing to grow as summer in the sunny Okanagan approaches. Due to a second very busy sales year, our inventory remains lower than usual, with sales not showing any signs of slowing.